Attending a Corona Cigar Co. event will often get you a chance at exclusive cigars. During the Drew Estate event there were JD4's that could be procured. At this weekend’s Don Pepin event there was an opportunity to get a hold of the My Father Special, a cigar only available at Pepin events. I was fortunate enough to receive one and thought I would share it on the Corona Cigar blog. 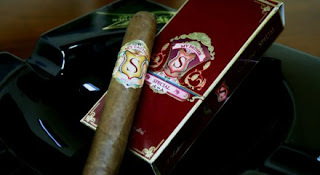 The first thing I was told when I was handed the cigar was that it smokes like the old Centurion blend. And it does, which I was very happy to find out. The Centurion was an amazing blend that smoked great out of the box, but when aged a little bit, oh man, it was amazing. The My Father Special did not disappoint, and upon finishing left me begging the rep for just one more sample. He kindly obliged. The cigar is full bodied, with a medium to full strength. There is loads of spice and dry roast coffee on the palate with a long finish that starts of dry but turns creamy and slightly sweet. It’s almost like the flavor grows from the back of the tongue to the sides and then tingles at the tip. The My Father Special is just that, a very special cigar. Try and get out to the next Pepin event to get one.